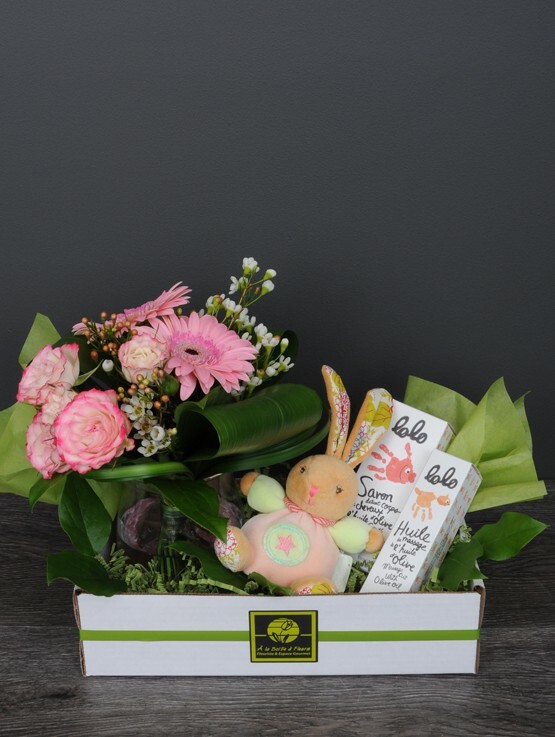 À la Boite à Fleurs offers bouquets, gourmet products, gift packs and a decor rental service to customers from Laval, Montreal, Rive-Nord and Rive-Sud. Offering on site a wide variety of trendy accessories, the company gathers in its flower shop trained florist designers who make of each floral arrangement an absolute masterpiece! Passionate by flowers for 50 years! À la Boite à Fleurs is a boutique in Laval that was founded in 1966 by Denise Locas, a forwarded-thinking woman who wanted to finance her children studies. This woman with an extraordinary talent and a steely determination was able to run the business for nearly 30 years, and then moved the guides to her daughter Francine Locas-Joly in 1995. Very young self-taught, Francine enjoys to learn and discover her flowers passion to people around her. For years she teaches, gives lectures and workshops. From 1999 to 2005, she was a columnist in floral art at LES SAISONS DE CLODINE. In 2003, she published the first issue of a magazine titled “Fleurs Déco : une première au Québec!”. This magazine has over 30 projects to be implemented, practical advices, ideas and a list of supplies to perform. In 2005, the second number appeared. Francine loves relax and stays abreast of all that is trendy in the industry. Every year, she discovers a new country where she finds ideas that she takes pleasure to share with you. Like her mother did, Francine has sent to her daughter Stéphanie Joly genes of love and passion for flowers. Even higher, even further, Stéphanie has lots of projects in mind. Graduated in presentation design and holding a Bacchelor degree in Management (Marketing concentration and Entrepreneurship) from McGill University, Stéphanie has now all the tools and experience required to ensure the continuity of the family business. It is in autumn 2010 that Marie-Ève Joly, Francine’s oldest daughter, joined the company. Graduated of the Institut du tourisme et de l’hôtellerie du Québec and director of the renowned dining restaurant Les Menus Plaisirs in Ste-Rose for nearly 10 years, she won the 2010 Grand Prix du Tourisme du Québec, Lauréat Or, tourism supervisor category. Since she joined the team, Marie-Ève is in charge of l’Espace Gourmet. She is the one offering an impeccable customers service, always presenting gourmet finds, giving thoughtful advices and her passion for gourmet products! 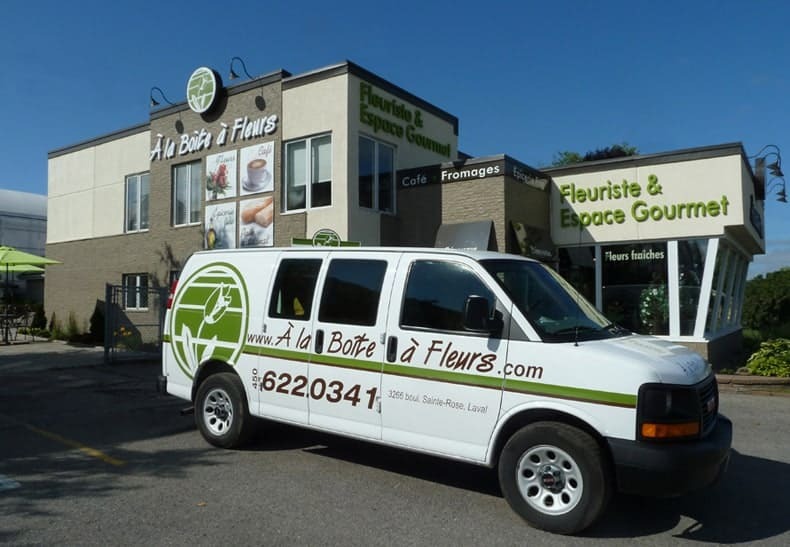 À la Boite à Fleurs is an accessible florist that meets the needs of its diverse clientele. Also, over time, we are proud to have been present in great festivities and have collaborated with major celebrities. For several years, we have worked with renowned companies such as Alimentation Couche-Tard, Quebecor World Media, les Productions J, les Productions Feeling and many others. À la Boite à Fleurs has also been a proud partner of many causes and events, such as Star Académie, la Série Montreal-Quebec, le lancement de la Chaire de recherche en oncologie ORL Dr Azar | Angélil, la Société canadienne du cancer and la Fondation des maladies du coeur et de l’AVC. Her love for flowers is absolutely contagious! She shares her inspirations and her vision with so much enthousiasm! Animated and passionated by traveling, she always comes back with great finds that she shares with us! Creative and ambitious, Stéphanie loves new challenges! Her mission? Always renew herself and create “wow” results with her team! She transforms every event on something even more magical! She is also the one who communicates with you on social networks about the latest trends, discoveries, tips & tricks, and more! It’s thanks to Marie-Ève that l’Espace Gourmet is what it is and that it knows this success! Listening to her customers and always on the look out for new gourmet discoveries, she is continuously looking for new, original and high-quality products. She never hesitates to share her culinary tricks and transmit you her passion for all those sweet & salted pleasures! With a welcoming and gentle nature, Cécile is such a precious pearl! Her creations are beautifully and originally presented. She has an incredible talent! Always cheerful, devoted and talented, she is really inspiring! In the process of obtaining her DVS in “Décoration intérieure et présentation visuelle” Joanie is a meticulous and careful florist. Her interest for interior design and decoration are an asset to the team! Working with finesse and refinement, she has a wonderful concern of the customers’ needs! Her passion for flowers has led Marykim to return to school in Floristry. Her smiling and cheerful personality as well as her designs that perfectly reflect her artistic side will certainly please you! A stop at l’Espace Gourmet with Véronique is undoubtedly the discovery of new flavors and divine blends! Having an excellent knowledge of the products, we love her bubbly personality and her sense for adventure! You will also see him knocking at your door, flowers in his hands! Serge G. is a very accommodating and efficient man. He constantly wants to improve the customer service. We love his kindness and courtesy!